A warm welcome awaits you at the Howard Johnson Maingate Resort. Selected as a Howard Johnson Gold Medal Hotel, we feature all the facilities and services travelers expect to find at a resort hotel at a moderate price. 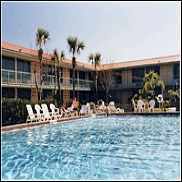 The resort features a year round covered heated pool and Jacuzzi plus 2 outdoor pools, tennis courts, playground, gameroom and a gift shop. A free shuttle to the Disney World is available. Amenities include climate controlled oversized rooms, remote control cable TV, direct dial telephones with modems, iron iron board, double vanity and sitting area with table andchairs. Orlando area Hotel located 3 miles from Disney World's Maingate and minutes away from Universal Studios in Orlando, Florida. There is a restaurant and convenience store in the hotel as well as a lounge and a pool side bar. Local attractions include, Walt Disney World, Sea World, Universal Studios, Water Mania, Jungleland, Wet & Wild and the Magic Kingdom Park. From Orlando International Airport. Via SR 528 take the SR 528 West (portions toll) to I4 West to Exit 64 B (US Hwy 192) 3 miles past Disney on the left side of US 192 West. Via SR 417 take SR 417 South (portions toll) to Exit 2 (Celebration) Right onto Celebration Ave. Left on US 192 West (Irlo Bronson Hwy) 3 mile past Disney on the left of Hwy 192 West. Orlando's newest, totally redesigned, with full amenity package, state of the art hotel offering introductory low rates. We offer complimentary transportation to the Orlando International Airport. All rooms are complete with coffee makers, hair dryer, in room safe and voice mail. Executive King rooms are furnished with ergonomic desk and chair, 2 line speakerphones with data ports and iron with ironing board. All suites have a parlour area with pull out sofa, kitchenette, 2 line speakerphones with data ports and iron with ironing board. Enjoy our tropically landscaped courtyard accented with a large pool, or work out in our fitness centre. For the business minded we have 2,000 sq. ft. of meeting space and a business centre. Need a bite to eat-enjoy our on site restaurant. Our atrium lobby is complete with gift shop, ATM, car rental and guest service desk. The Howard Johnson Resort Hotel and Suites is located conveniently to all area attractions and just 2.5 miles from the Orlando International Airport. The beach and Kennedy Space Centre are only 45 minutes away. Come and enjoy our hotel and excellent customer service. Hotel is convenient to Orlando International Airport and Florida Mall, 18 miles from Walt Disney World, 8 miles from SeaWorld and 12 miles from Universal Studios and Wet 'n Wild. From Orlando International Airport: AIRPORT EXIT becomes S ACCESS RD. S ACCESS RD becomes BOGGY CREEK RD. Turn RIGHT onto TRADEPORT DR. Turn LEFT onto MCCOY RD. MCCOY RD becomes MCCOY RD/FL-482. The four star Renaissance Hotel Orlando Airport is an excellent hotel with an inviting European-style ambience. Outstanding service has earned the hotel the U.S. Association Executive magazine's distinguished Aster Award for outstanding service and excellent conference facilities. It is conveniently located at Orlando International Airport. Guestrooms are tastefully appointed with amenities such as work desk with lamp, two-line phone with data port and voicemail, cable TV and in-room movies, complimentary in-room coffee, iron and ironing board, hairdryer and bathrobe. the hotel has an outdoor pool, whirlpool, sauna and full exercise facility. The hotel's business center provides a full array of services and there is a concierge service to assist guests during their stay. 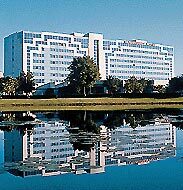 The Renaissance Orlando Hotel is situated just one mile from the Orlando International Airport. The property is within close proximity to Orlando's central business district, Airport Corporate Complex and the Orlando Convention Center. The Renaissance has its own restaurants, the Bierstube and Forbes Place, serving a varied menu of delicious food. Belz Outlets 8 Miles. Citrus Bowl 8 Miles. Universal's City Walk 8 Miles. Cocoa Beach 40 Miles. Daytona Beach 80 Miles. Downtown Disney/Pleasure Island 12 Miles. Florida Mall 6 Miles. Kennedy Space Center 50 Miles. Lake Buena Vista 15 Miles. Orlando/Orange County Convention Center 10 Miles. Pointe Orlando 10 Miles. Sea World 7 Miles. Discovery Cove 7 Miles. TD Waterhouse Center 8 Miles. Universal Studios 8 Miles. Walt Disney World Theme Parks 12 Miles. Wet 'N Wild 12 Miles. From Orlando Int'l Airport: Take north exit 436 north to first traffic light. Turn left onto Frontage Road. The hotel is located 1/8 mile on the right hand side. The 4 star Peabody Orlando is a deluxe, modern, full-service hotel, often described as "the finest hotel in Orlando". It is 12 miles from Orlando International Airport. With an air of opulence and sophistication, it is the perfect venue for a stay in the vibrant city of Orlando. There are a total of 833 guestrooms and 58 suites at the Peabody. Each is beautifully decorated and furnished throughout. Amenities include deluxe bathrooms, cable TV, two twin-line phones with voicemail and dataports, hair dryer and mini bar. The luxurious hotel is Orlando to the world famous Peabody Ducks, who appear daily in the lobby at 11:00 AM and 5:00 PM a tradition dating back more than 70 years. With a plethora of highly trained, professional staff, guests can be sure of the highest standards in service. The list of activities on offer is almost endless, highlights include the Peabody Athletic Club, the stunning swimming pool and the array of treatments on offer at the spa and beauty salon. For the business guest, no detail is overlooked to ensure that meetings, conferences and seminars are remembered for all the right reasons. Directly across from the Orlando/Orange County Convention Center, the luxurious Peabody Orlando is 15 short minutes to Disney, and 5 minutes to Sea World and Universal Studios. From the award winning Dux Restaurant, which serves American haute cuisine with "global accents" to the airy informality of the B-Line Diner, the Peabody has a justified reputation for excellent food. Capriccio captures the essence of Northern Italy and transports it to sunny Florida. Elsewhere in the hotel, there are cafes and bars serving a variety of drinks and snacks. The hotel is located just minutes to Walt Disney World, Sea World, Universal Studios, Epcot Center, Belz Factory Outlet, Church Street Station, Disney-MGM Studios and Wet 'n' Wild. Take the "NORTH EXIT" as you exit the airport. 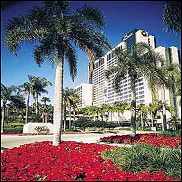 Take "TOLL ROAD 528" WEST, travel approximately 11 miles to EXIT #1/ International Dr/ Convention Center/Sea World. Bear right onto International Drive. The Peabody is 1/4 mile on the right 27 stories high.